Dulce de leche is a caramel-like confection made from hours of slowly boiling sweetened milk to result in the Maillard reaction, and thereby turning it into the culinary pot of gold that no one can get enough of. Dulce de Leche translates from Spanish into "candy made of milk" and it is a well-loved staple in the Latin world as well as in France, Portugal and Spain. Having missed this taste of home, Argentinean expat Juan Casalins began making his own Dulce de leche from fresh milk from the cows in Assos, where he and his Turkish wife Gizem Selçuk operate a lovely boutique hotel, Nar Konak. In fact, Juan and Gizem's story is just as delightful as the Dulce de leche they make. They met in Panama while working on the production of Turkey's "Survivor," the reality/game show of physical challenges. Juan, an industrial designer by profession, was a game designer on the set, in charge of actually creating and building the games competed in. He has actually worked on three different Turkish "Survivor" series. Gizem, who just happened to be fluent in Spanish, worked in production and as a language coordinator between the Argentineans and Turks on set and that's how she met Juan. "We met on an island," she says, emphasizing, "A very small island with not many people." Just a few years later in 2012, Juan made the big move to Turkey, spending five months in Istanbul studying Turkish and English before he and Gizem came to Assos. A historical and picturesque village in Çanakkale that has a commanding spot overlooking the Aegean where Aristotle once founded his famous school of philosophers, Juan and Gizem took over the management of her parents' hotel in Assos, Nar Konak, which just happens to be a beautiful five-bedroom boutique hotel set in lovely renovated rooms of three 150-year-old stone houses. They have certainly become one of the most popular stops in this special town, as their 9.8 booking.com rating will attest to. In addition to receiving an award for excellence, by the latter, for two years in a row, they have also won TripAdvisor's Travelers' Choice award for boutique hotels. 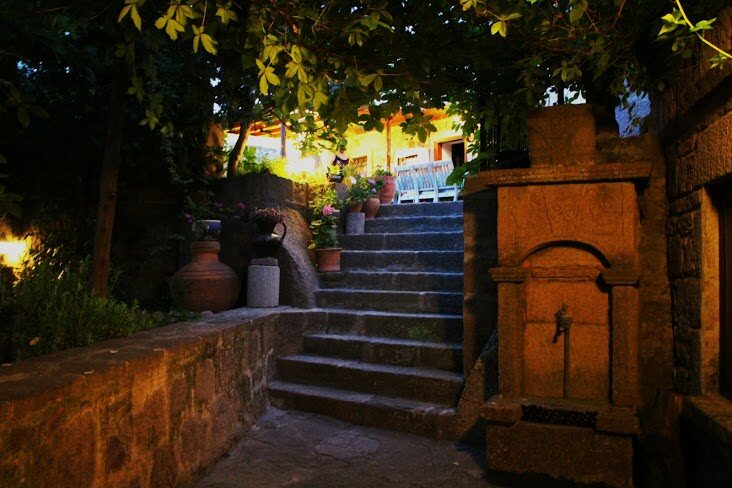 Now, there is a whole other reason to stop in Assos and pay a visit to Nar Konak and that is because this is where you can try for yourself this new taste that has taken Turkey by storm. Not only do Juan and Gizem sell out regularly of the small-scale production they currently offer, but they have also been nominated as "Best new taste" by TimeOut magazine. Referred to in Turkish as "Süt Karamel"' Gizem and Juan have seen unprecedented success with their very special product and anyone who tastes it becomes obsessed, I certainly know from personal experience. So, I asked Juan how the Dulce de leche story started. He told me he was simply missing the taste from home. "It's the Argentinean syndrome," Gizem says. "I remembered my grandmother's recipe," Juan tells me. "And so when Gizem's mother brought me a liter of fresh cow's milk, I gave it a try." He spent five hours stirring the concoction consistently on a gas stove, outside, unsure how it would turn out. However, "For me, it was incredible because it was exactly like my grandma's, then we made it again and began serving it at breakfast and people began sending our homemade jams back and were asking for more Dulce de leche," Gizem chimes in. And so the demand began to grow as word of mouth and taste sharing took hold. Suddenly Dulce de leche had become something very special. Made from the freshest milk possible, cooked into this divine caramel as soon as it has been milked. They have now reached a production volume of 44 kilos per month, and they sell out regularly. Their website www.dulcedelecheturkey.com offers a countdown ticker showing how many kilos are left each month. The key to this very special taste is the long hours of stirring with a wooden spoon and Juan with his game-designing background, has engineered his own wooden spoon-turning mechanism that incorporates the exact angle, direction and pauses that would be used by hand. 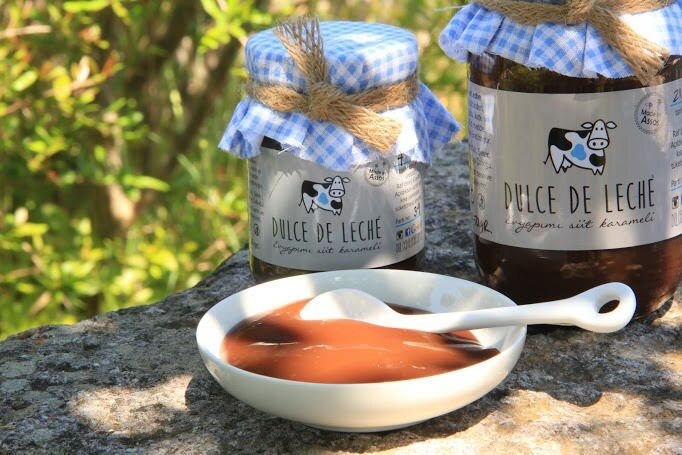 This is what especially makes their product unique, while Dulce de leche has become industrialized for the most part, Juan and Gizem's recipe remains true to the original method of using fresh products and hand-stirring. One day in fact they even received a personal phone call from the Argentinean Ambassador in Ankara Juan Jose Arcuri, who told them it was the best Dulce de leche he had ever had in the world and he couldn't believe he was having it in Turkey. He said it brought him right back to his childhood and a time when his grandmother used to make this sweet herself. Just three days later, Juan and Gizem heard news that during an interview with the state-broadcaster TRT, the Argentinean Ambassador not only mentioned the "love story" of an Argentinean and a Turk in Assos, but also had a jar of their special product with him that he displayed on the screen for viewers. Juan and Gizem have seen unprecedented success with their very special product and now they have been nominated in the TimeOut's "Best Unique Taste" category, which you can vote for until the end of the year. Their customers loved their product so much they soon began packaging them in jars with their own label, drawn up by Juan. I asked Gizem what kind of reaction they have received from people, to which she said she has never seen anyone react so sincerely to a taste. "I have had e-mails with people telling me they want to hug the blue cow on the label!" Serving up this specialty as part of their breakfast at Nar Konak, they decided in winter to focus on producing as much as they can. They set up their website and are now actively pursuing setting up a small-scale factory and production space in order to grow slightly. 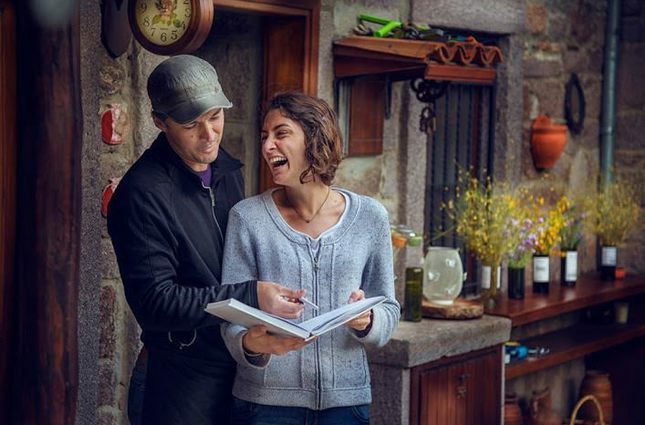 The reception they have gotten from distributors and shops has been insane, but this Turkish-Argentinean couple, which have made the village of Assos their home, do not want to grow too much to ensure their product maintains the same integrity. Instead of being in shops all over the place, they would love for their product to be associated with Assos and for people to visit their hotel and give it a try for themselves. I asked Juan what are the many ways Dulce de leche can be used to which he tells me that similar to jam it can be spread on bread and cakes, mixed in with hot milk or served as a dipping sauce with fruit, and goes especially well with bananas, he adds. There are three sizes on offer, a 250-gram jar costs TL 20 ($7), a 450-gram jar costs TL 30, but includes an extra 40 gram mini-taster jar and a mega 1,200 gram jar will cost you TL 72, and there are special deals on delivery. I asked Juan how he likes living in Turkey and a small village on the Aegean coast. He said, "It's incredible, because the Turkish people here are just like Argentineans, they aren't like typical Europeans, Turks are warm and have strong family connections." And as for the village life, I asked him, "For me, it is not a challenge because in Argentina I lived in the countryside. It is quieter here and in winter after 5 p.m. sometimes there is no one and complete silence. But, we are active and if I'm not making Dulce de leche then I am doing carpentry work on the hotel or am pursuing other projects." Gizem meanwhile also doubles as a filmmaker and is currently finishing up the post production stage of a documentary on camel wrestling she filmed with Sibel Şamlı titled "Holy Camel?! : A true love story." It's set to screen at next year's Istanbul Film Festival. So, there are a number of reasons to get to know this attractive, energetic, creative and dynamic duo whether it is visiting their stunning hotel set on a hilltop in the ancient town of Assos, trying their delectable Dulce or just listening to the intriguing and fun story of their lives. Their Dulce de leche has even been written up about in Travel and Leisure magazine. The perfect Christmas gift, this very special product sells at Kafes Fırın, a popular bakery chain in Ankara, and is available for order on their website. But of course, I would highly recommend making the trip out to Assos to stay in their hotel, which is open year-round, and meet them in person!